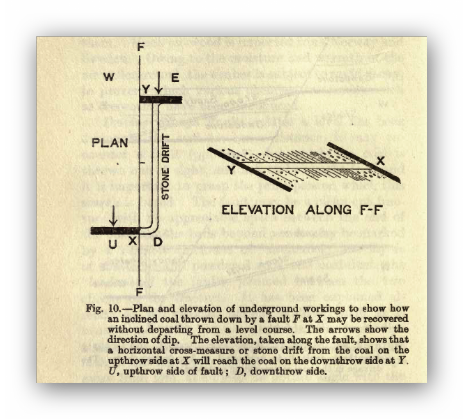 One of the earliest forms of underground mining where a central shaft would be sunk into the seam and the minerals worked outwards from the shaft until the pit roof was in imminent danger of collapsing whereupon a new shaft would be sunk nearby. The completed pit would resemble a bell shape inside hence the name bell pit. Any wasted materials would be used to fill in the worked out bells nearby. 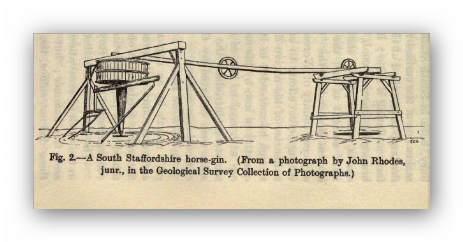 The materials would be hoisted up on a wooden rope winch or windlass with a basket attached to it, to enter the pit a wooden ladder may have been used. Many examples of this type of mining can be found in the area from Brimington through Inkersall to Duckmanton and beyond. There presence can be indicated by circular indentations in the ground with a growth of young trees about the area of the disturbed ground. (See Westwood). In coal mining from the 17th. Century two systems or variants of the two were employed locally. The stall and pillar or bord and pillar and the longwall. 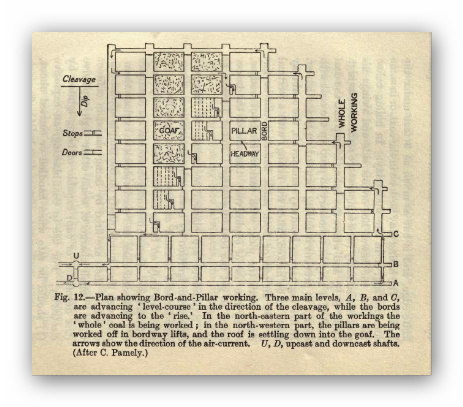 An early form of mining in which the workings were set out in squares to gain maximum support in the shallow seams. 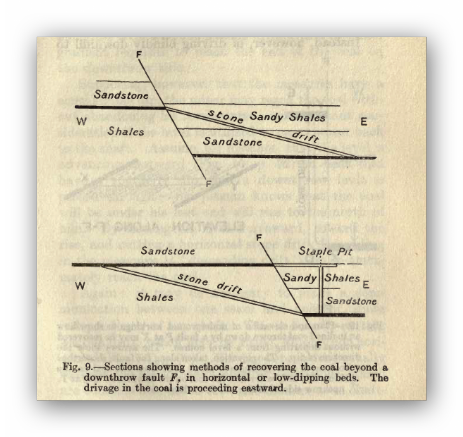 Roadways were driven through the seam at right angles to each other (stalls) and alternate blocks of coal were removed. 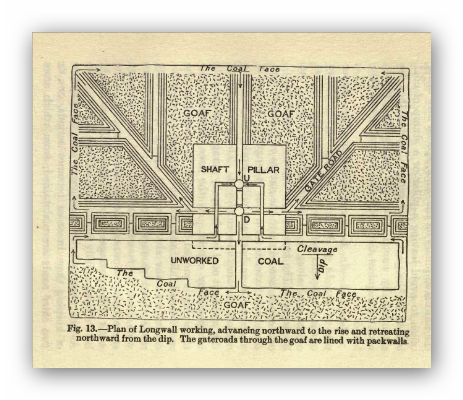 Pillars of coal were mined alternately giving good roof support but wasting coal by leaving pillars for support. 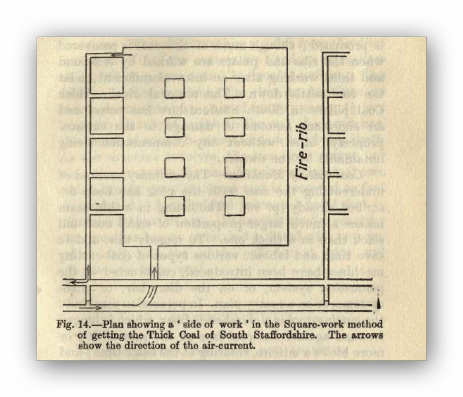 A mining method presumed to have been 'invented' in Shropshire mines and used three shift working. 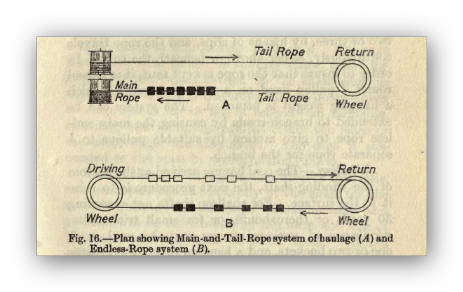 Modern mining has its roots in this system. 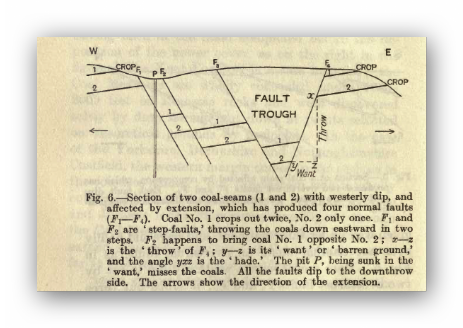 John Farey writing in 1811 about the local coal mining operations described the system as follows. 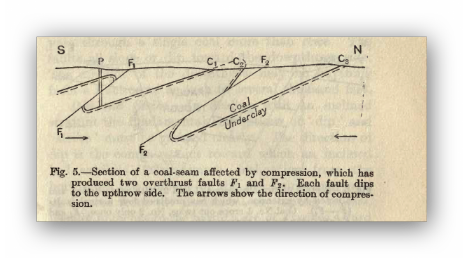 Firstly a night shift of Holers undermine the entire seam of coal on the bank or face, they do this by chipping away at the bottom of the seam with a pick thus creating a wedge at the bottom of the coal (Undercutting). Small wooden props are placed at intervals along the face to support the seam. 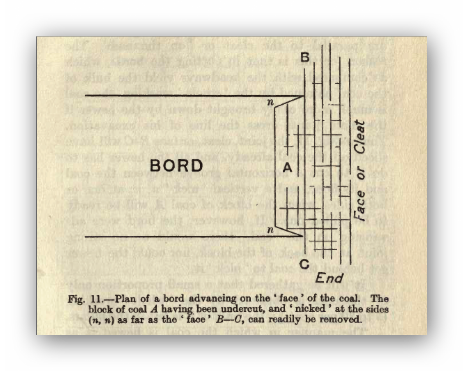 At one or both ends of the face a vertical cut is made to allow the next shift to drop the coal from the gate end along the length of the bank. 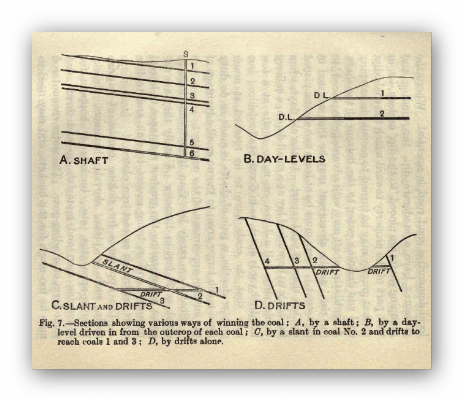 Secondly the Hammermen or Drivers drive long sharp iron wedges into the top of the seam with hammers which allows the coal to drop in large blocks many yards long. The Drivers are followed by a Rembler who breaks up the coal into manageable pieces for the Loaders to load into the tubs or boxes for transportation. Most tools were made of wood until late into the eighteenth century as the expense of iron tools made them prohibitive to use. 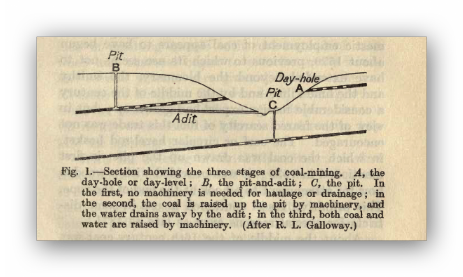 The coal was loaded into the tubs using wooden forks at many local mines so as not to include slack and a ton of coal for a collier to load was twenty-two or more hundredweight to allow for any dirt or slack. Thirdly the final group of men the Timberers or Punchers bring in seasoned timber supports cut from local woods or plantations to support the roof. The face is ready for the system to start up again. 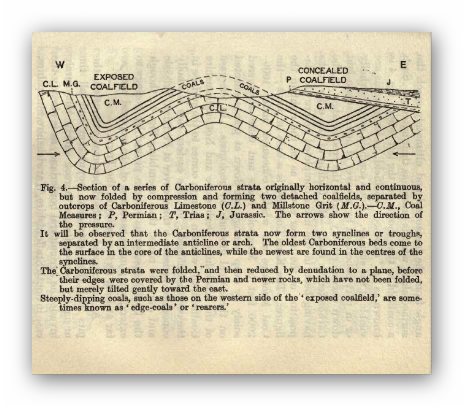 John Farey writing in 1811 said of John Charleton of Calow, 'a very ingenious mechanic, collier and iron smelter'. 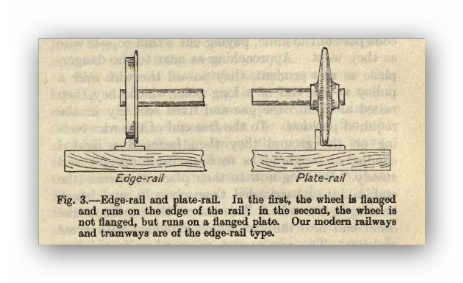 On the 10th April 1802 John Charleton invented and patented cast iron puncheons or stanchions and caps for mine roof support. Which by being fluted and braced were both strong and light. 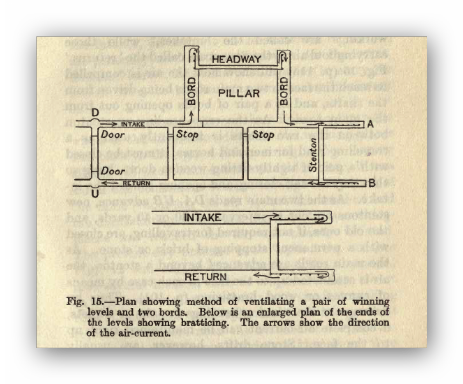 However, miners resented their use and when they were introduced into the Butterley company mines in the 1920's their use was met with a threatened strike because try did not emit a cracking sound when the weight came on them warning of imminent roof collapse, unlike the timber roof supports did. 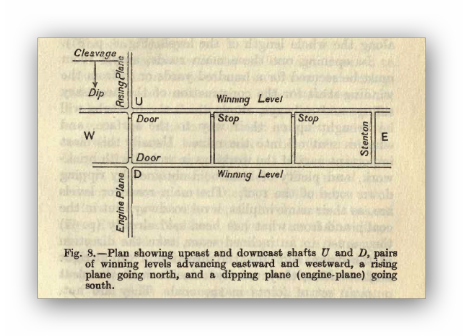 One improvement to the transportation of minerals both underground and at the pit head was the flanged iron rail or tramplate as we know them today, they were invented by John Curr, viewer of Sheffield colliery in 1787 and these gradually replaced the wooden ones underground. They were probably first used by Joseph Butler the Ironmaster at the surface of his collieries at Wingerworth. See also 'The Bolsover Story'.